In The Fight Against Tsetse Flies, Blue Is The New Black : Goats and Soda For some unknown reason, the insects that transmit sleeping sickness in sub-Saharan Africa are attracted to the color blue. So scientists think blue flytraps could help wipe out the disease for good. 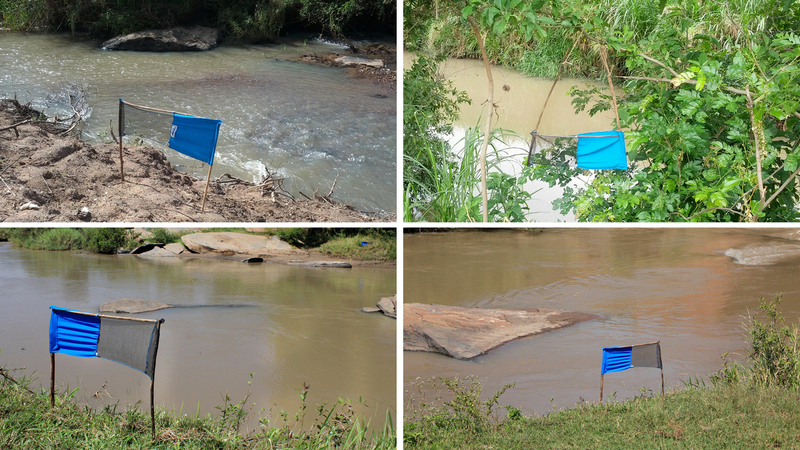 If you were a tsetse fly, you would be irresistibly attracted to these blue flags. Walk along one of the many streams and rivers in the West Nile region of Uganda, and you'll notice something funny. All along the riverbanks, you'll see small pieces of blue cloth, attached to wooden stakes in the ground. There's one every 50 yards or so. No, this isn't some half-baked public art project. These dinky contraptions are actually flytraps, designed to lure and kill tsetse flies, whose bites transmit a parasitic disease called sleeping sickness, which, like rabies, drives victims mad before it kills them. Sleeping sickness is a scourge of sub-Saharan Africa — around 7,000 cases were reported in 2013. It can be cured with drugs, if it's detected early. But it's usually difficult to diagnose. Early symptoms are vague: headaches, joint pain and bouts of fever. By the time people realize they're infected, the parasite has often made its way to the brain, causing rapid mood swings and confusion. As the name suggests, the disease in its later stages also affects sleep, making it impossible to rest at night and impossible to stay awake during the day. "People don't understand what is happening to them. They think it's witchcraft, or they are cursed," says Charles Waiswa, a veterinarian at Makerere University in Kampala, Uganda, who directs a regional initiative against sleeping sickness. Treatment is expensive — the drugs can cost hundreds of dollars, though the World Health Organization distributes them for free. Plus, residents of rural villages often have trouble getting to hospitals where treatment is offered. And even those who survive are sometimes left physically or mentally impaired. "The worst part is the disease affects the communities that are already suffering the most, the poorest of the poor," Waiswa says. These rural communities heavily depend on the rivers where tsetse flies breed. "These people have to go to the river to collect firewood, do the wash and of course, to collect water, because unlike those who live in the cities, they don't have access to tap water." And tsetse flies don't just bite humans. They also transmit disease to cattle and other animals, which can devastate agriculture. So scientists have been looking for ways to cut down the tsetse population. And they've discovered that the flies' Achilles heel is the color blue. "When the tsetse flies are looking for targets to bite, they're generally looking for something that contrasts with the green vegetation," explains Steve Torr, an entomologist at the University of Liverpool in the U.K. "They're attracted to bright colors, and for some reason they're especially attracted to bright blue." With that in mind, Torr and his colleagues set out to design the ultimate flytrap. It consists of a small piece of blue cloth, "about the size of a handkerchief," Torr says, plus a panel of fine netting covered in insecticide. The blue material catches the flies' interest. As the tsetses circle the blue cloth, mesmerized, they hit the poisoned netting, which they can't see. The insecticide kills them within three minutes. Since last November, Torr's research team — with help from local health workers — has installed some 17,500 traps, covering about 1,500 square miles in northern Uganda. The researchers' early estimates show the strategy is working: The tsetse population in the region is down by almost 90 percent. "That's because tsetse flies breed very slowly," Torr says. Unlike mosquitoes, which lay hundreds of eggs all at once, tsetse flies give birth just once every nine days — so it's relatively easy to quickly reduce their numbers. Still, traps aren't perfect: they have to be replaced every six months and can get washed away during heavy rains. But they are relatively cheap; it costs about $240 to set traps across one square mile of land. Spraying areas with insecticide, in contrast, can cost several times that. And while dousing cattle in insecticide is just as effective as setting traps, it's not an option for communities that don't raise livestock. "Of course, we're not trying to kill off the tsetse flies altogether, we just want to kill off those that carry the sleeping sickness parasite," Torr says. About one in 1,000 flies carries the parasite — so if all goes well, the traps could weed out all the disease-carrying tsetse over the course of five or six years. Thanks to a concerted effort by the World Health Organization and local governments, cases of sleeping sickness are already on the decline. During the height of the most recent sleeping sickness epidemic, in the late 90s, the World Health Organization estimated that about 300,000 people were infected yearly. Last year, the number of confirmed cases was down to fewer than 10,000. Since the blue traps were installed, researchers have been testing the blood of locals and closely tracking cases of sleeping sickness in northern Uganda. Combined with amped up treatment efforts, the traps could help eliminate sleeping sickness for good, says Dr. Charles Wamboga, who works with Uganda's Ministry of Health and isn't involved in the fly trap initiative. Over the course of his medical career, Wamboga has treated hundreds of infected patients. "Already there are fewer cases than there used to be. And the cases we are seeing are not so bad," Wamboga says. "It will take a lot of resources to maintain this reduction, but we are doing well so far. And if we keep it up, I think we can do it — we can eliminate this terrible disease."